Obama’s Small Donors: Slow, or Perfectly Normal? The article begins to address this question by noting that many of the people who made small donations to Obama’s 2008 campaign have not yet donated to his 2012 campaign. The author interprets this as saying that Obama is having difficulty with an important group of 2008 supporters, and is thus losing an important source of fundraising (not to mention other forms of support, such as potential volunteers). Yet, to draw this conclusion we would need to find a difference between present fundraising numbers and expectations based on past performance. 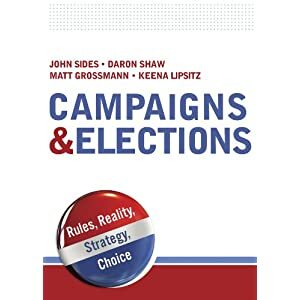 It is only later in the campaign – once the candidates had gained visibility, communicated their message, and established a greater sense of electability (and large donors had already given the maximum allowed under federal law) – that the data tell a different story. 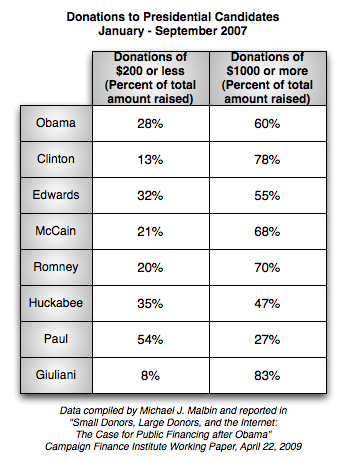 For example, from March through May 2008, Obama raised 63% of his funds in amounts of $200 or less. Clinton reported a similar distribution, raising 61% of her money in these smaller amounts during this time. McCain, however, only raised 23% in these smaller amounts during these latter primary months. The upshot is that we should not be surprised that small donors are “slow” to return at this early stage of the 2012 race. In fact, I would argue that their behavior is not “slow” at all, but instead perfectly normal. At this point we cannot conclude anything about possible fundraising challenges down the line. To be sure, Obama has incumbency status that he did not have in 2007, and that could certainly affect donor behavior. But, at the same time, Obama has not really gotten his campaign off the ground yet. He has not yet had the chance to exert substantial effort in defining the choice facing voters and trying to gain a perception of electability. When it comes to small donors, the “challenges” he faces are not unlike those that he and others faced in 1999, 2003, and 2007. Small donors evidently take a wait and see approach. It is thus far too early to see what comes of the donors in the NYT’s story, and more generally the 2008 “small donor revolution”. * By “small donor” I am referring to the common usage – someone who donated in small amounts that were less than $200. Note, however, that many small donors gave enough small donations during the 2007-2008 campaign such that the total was quite large. One Response to Obama’s Small Donors: Slow, or Perfectly Normal? Not only is it early in the overall campaign, but he faces no primary challenge. So the effective campaign (and the pressure on donors) starts much later for him than it does for the Republicans or for either party in 2008.